It’s homecoming in Absaroka County, but the football and festivities are interrupted when a homeless boy wanders into town. A Mormon “lost boy,” Cord Lynear is searching for his missing mother but clues are scarce. 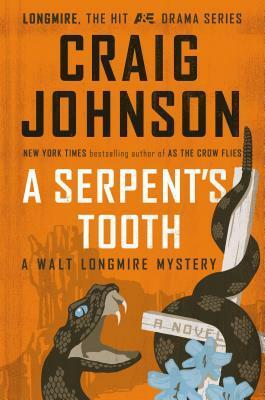 Sheriff Walt Longmire and his companions, feisty deputy Victoria Moretti and longtime friend Henry Standing Bear, embark on a high plains scavenger hunt in hopes of reuniting mother and son. The trail leads them to an interstate polygamy group that’s presiding over a stockpile of weapons and harboring a vicious vendetta. Over the past couple of years, Longmire has become one of my absolute favourite television shows. It's got beautiful cinematography coupled with brilliant writing and acting; multi-layered storytelling which is full of conflict and shades of grey. Lots of real-life issues threaded throughout exciting plotlines and fascinating character arcs - for the 'supporting cast' as well as the main players. It's an exquisite show, that just launched its sixth and final season on Netflix today (if you're in the USA, Canada, Australia, or New Zealand. UK viewers have to wait, unfortunately). Longmire the television show is based on the highly acclaimed, long-running mystery series by Wyoming author Craig Johnson. Until earlier this year, I hadn't yet gotten around to reading the actual books. What a mistake that was: Johnson is a fantastic writer, who's built an amazing 'world' in his writing; an authentic array of characters probing mysteries in a unique, richly drawn setting. The tone of the books is a little different to the TV show (both are great in their own right) - there's more humour, a little more warmth, and Sheriff Walt Longmire comes off as a little less gruff and action-oriented as we get more of a look at his interior world thanks to the first-person narration. In this ninth instalment, Walt and his deputy Vic Moretti stumble across a teen runaway with ties to a shady polygamist cult group who've been growing stronger on the fringes of Absaroka County. With stockpiles of weapons and an 'us vs them' mentality, the group might be a dangerous powderkeg. As Walt, Vic and Walt's long-time pal Henry Standing Bear (aka The Cheyenne Nation) try to reunite a lost boy and his mother, they encounter a host of eccentric individuals, including a Houdini-esque man who claims to be 200-year-old Mormon lawman, an elderly man who builds spaceships in his backyard, and an amiable woman who swapped life in the CIA for the rural idyll. There's a heck of a lot to like about Johnson's writing. He crafts rich characters that upturn stereotypes, is a master of dialogue, and offers mysteries that have plenty of heart and soul. Absaroka County may be a fictional place, but it feels incredibly real, full of fascinating people that are a delight to spend time with, whose adventures make you think and feel. I for one will be working my way through Johnson's backlist as he's become a must-read author for me.